What a name, Fancy Pony Land, but do not fear, its not a my little pony shiny rip off… its actually a fun fashion line of Lorna Leedy who grew up in Washington and is apparently now wandering the states in a Eurovan Camper. 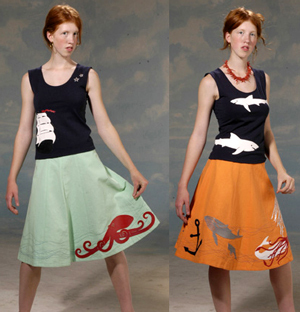 This collection with the oceanic theme is cute, and i’m liking the octopus skirt and the shark top, but put these all together and it feels very Ms. Frizzle from the Magic School Bus series i grew up on. Come to think of it - i think this could be a great line for fun elementary school teachers teaching an oceans lesson!